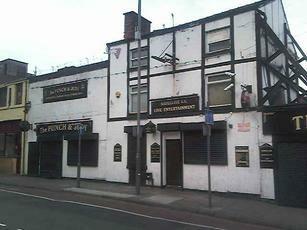 It was a toilet from the day it opened - even the bar across the road in the Ribble bus station was better. It blew up yesterday ! Punch & Judy is no more - the bulldozer was tearing it apart after the bad fire they had in the early hours. Fortunately no one was killed or injured. I was heading to Lime Street to catch a train and realised I had half an hour to kill. I happened to be walking past this place and dived in. What a mistake! I can't remember what I had to drink - I was too gobsmacked by the shabby interior of the pub and the bizarre mix of clintele, some of whom looked as though they entered the pub 10 years ago and have never left. I thought the New Penny Farthing was bad, the Punch and Judy must be it's long lost cousin! That was 2 years ago and I still have flashbacks! Would tend t agree with LM - even the two bars in the station are vastly superior to this hole. No proper beer - though it does sell everything your average wino buys to sit out in ther park with. This pub's disgusting, you can smell the khazis from a mile away, no real ale, seriously if your in Liverpool avoid this dump!!! !